The Tibetic languages (Tibetan: བོད་སྐད།) are a cluster of Tibeto-Burman languages descended from Old Tibetan, spoken across a wide area of eastern Central Asia bordering the Indian subcontinent, including the Tibetan Plateau and the Himalayas in Baltistan, Ladakh, Nepal, Sikkim, Bhutan and Arunachal Pradesh. Classical Tibetan is a major regional literary language, particularly for its use in Buddhist literature. Tibetic languages are spoken by some 6 million people. With the worldwide spread of Tibetan Buddhism, the Tibetan language has spread into the western world and can be found in many Buddhist publications and prayer materials; with some western students learning the language for translation of Tibetan texts. Outside Lhasa itself, Lhasa Tibetan is spoken by approximately 200,000 exile speakers who have moved from modern-day Tibet to India and other countries. Tibetan is also spoken by groups of ethnic minorities in Tibet who have lived in close proximity to Tibetans for centuries, but nevertheless retain their own languages and cultures. Although some of the Qiang peoples of Kham are classified by China as ethnic Tibetans (see rGyalrongic languages; rGyalrong people are identified as 'Tibetan' in China), Qiangic languages are not Tibetic, but rather form their own branch of the Sino-Tibetan language family. Classical Tibetan was not a tonal language, but some varieties such as Central and Khams Tibetan have developed tone registers. Amdo and Ladakhi-Balti are without tone. Tibetic morphology can generally be described as agglutinative. In addition, there is Baima, which retains an apparent Qiangic substratum, and has multiple layers of borrowing from Amdo, Khams, and Zhongu, but does not correspond to any established branch of Tibetic. The more divergent dialects such as this are spoken in the north and east near the Qiangic and Rgyalrongic languages, and some, such as Khalong, may also be due to language shift. The Tibetic languages used for broadcasting within China are Standard Tibetan (based on the Ü dialect of Lhasa and used as a lingua franca throughout Ü-Tsang), Khams and Amdo. Marius Zemp (2018) hypothesizes that Tibetan originated as a pidgin with the West Himalayish language Zhangzhung as its superstratum, and Rgyalrongic as its substratum. Similarly, Tamangic also has a West Himalayish superstratum, but its substratum is derived from a different Sino-Tibetan branch. Most dialects of Ngari Prefecture in western Tibet, of the northern Nepalese border area in Nepal, Tsang dialects of Shigatse Prefecture, and Ü dialects (Lhokha, Lhasa, etc.). The basis of Standard Tibetan. Dzongkha, Brokkat, Brokpa, Chocangaca, Lakha, Laya dialect, Lunana dialect. 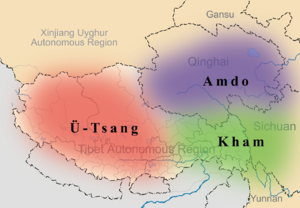 Some classifications group Khams and Amdo together as Eastern Tibetan (not to be confused with East Bodish, whose speakers are not ethnically Tibetan). Some, like Tournadre, break up Central Tibetan. Phrases such as 'Central Tibetan' and 'Central Bodish' may or may not be synonymous: Southern (Central) Tibetan can be found as Southern Bodish, for example; 'Central Tibetan' may mean dBus or all tonal lects apart from Khams; 'Western Bodish' may be used for the non-tonal western lects while 'Western Tibetan' is used for the tonal lects, or 'Bodish' may even be used for other branches of the Tibeto-Kanauri languages. Most Tibetic languages are written in one of two Indic scripts. Standard Tibetan and most other Tibetic languages are written in the Tibetan script with a historically conservative orthography (see below) that helps unify the Tibetan-language area. Some other Tibetan languages (in India and Nepal) are written in the related Devanagari script, which is also used to write Hindi, Nepali and many other languages. However, some Ladakhi and Balti speakers write with the Urdu script; this occurs almost exclusively in Pakistan. The Tibetan script fell out of use in Pakistani Baltistan hundreds of years ago upon the region's adoption of Islam. However, increased concern among Balti people for the preservation of their language and traditions, especially in the face of strong Punjabi cultural influence throughout Pakistan, has fostered renewed interest in reviving the Tibetan script and using it alongside the Arabic-Persian script. Many shops in Baltistan's capital Skardu in Pakistan's "Northern Areas" region have begun supplementing signs written in the Arabic-Persian script with signs written in the Tibetan script. Baltis see this initiative not as separatist but rather as part of an attempt to preserve the cultural aspects of their region which has shared a close history with neighbors like Kashmiris and Punjabis since the arrival of Islam in the region many centuries ago. Old Tibetan phonology is rather accurately rendered by the script. The finals were pronounced devoiced although they are written as voiced, the prefix letters assimilated their voicing to the root letters. The graphic combinations hr and lh represent voiceless and not necessarily aspirate correspondences to r and l respectively. The letter ' was pronounced as a voiced guttural fricative before vowels but as homorganic prenasalization before consonants. Whether the gigu verso had phonetic meaning or not remains controversial. Already in the 9th century the process of cluster simplification, devoicing and tonogenesis had begun in the central dialects can be shown with Tibetan words transliterated in other languages, particularly Middle Chinese but also Uyghur. Proto-Tibetic, the hypothetical proto-language ancestral to the Tibetic languages, has been reconstructed by Tournadre (2014). Proto-Tibetic is similar to, but not identical to, written Classical Literary Tibetan. The following phonological features are characteristic of Proto-Tibetic (Tournadre 2014: 113). Palatalization of dental and alveolar consonants before y (/j/). Distinctive aspirated initial stops. This phenomenon is attested by alternating aspirated and non-aspirated consonants in Old Tibetan orthography. Examples include gcig ~ gchig (གཅིག་ ~ གཆིག་) ‘one’; phyin-chad ~ phyin-cad (ཕྱིན་ཆད་ ~ ཕྱིན་ཅད་) ‘from now on’; ci ~ chi (ཅི་ ~ ཆི་) ‘what’; and cu ~ chu (ཅུ་ ~ ཆུ་) ‘water’. *ty-, *ly-, *sy- were not palatalized in Pre-Tibetic, but underwent palatalization in Proto-Tibetic (Tournadre 2014: 113-114). Posited sound changes from Pre-Tibetic to Proto-Tibetic include *ty- > *tɕ-, *sy- > *ɕ-, *tsy- > *tɕ-, and *ly- > *ʑ-. However, Tournadre (2014: 114) notes that many Bodish languages such as Basum, Tamang, and Kurtöp (East Bodish) have not undergone these changes (e.g., Bake (Basum) ti ‘what’ vs. Proto-Tibetic *tɕ(h)i and Bake tɨ ‘one’ vs. Proto-Tibetic *g(ǝ)-tɕ(h)ik; Kurtöp Hla: ‘iron’ and Bumthap lak ‘iron’ vs. Proto-Tibetic *ltɕaks). ^ Hammarström, Harald; Forkel, Robert; Haspelmath, Martin, eds. (2017). "Early Old Tibetan". Glottolog 3.0. Jena, Germany: Max Planck Institute for the Science of Human History. ^ Zemp, Marius. 2018. On the origins of Tibetan. Proceedings of the 51st International Conference on Sino-Tibetan Languages and Linguistics (2018). Kyoto: Kyoto University. van Driem, George (2001). Languages of the Himalayas: An Ethnolinguistic Handbook of the Greater Himalayan Region containing an Introduction to the Symbiotic Theory of Language. Brill. ISBN 9004103902.